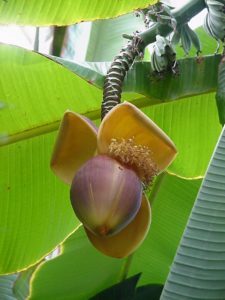 Musa x paradisiaca ‘Dwarf Cavendish’ is an evergreen perennial which produces stems up 4m tall, huge paddle – like leaves to 1.2m long and edible bananas up to 25cm long in clusters of up to 90. Most people refer to them as banana ‘trees’, though due to not having a woody trunk are not trees at all. They are in fact the biggest herbaceous plant in the world. To fruit, they need plenty warmth, food and water during the spring and summer. They can also be grown as a summer bedding plant to add height and exoticism with their wonderful leaves, though are unlikely to flower and fruit outside in the U.K.